Welcome to 1871 Lakeview Drive. 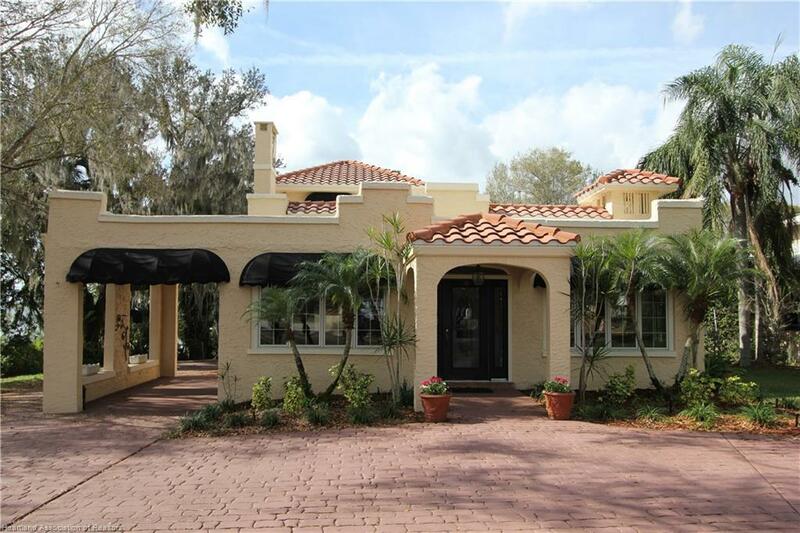 Inviting curb appeal and Coral Gable's charm welcomes you to this beautiful 1925 Spanish revival architectural style home on the shores of Lake Jackson and in the heart of Sebring. The home is situated 35,000 square foot lot with 100 of lakefront. Privately tucked away behind a wall with terracotta tile accents, the circular driveway leads the way to the front door. Enter the front door into a beautiful sunroom with clay tiled flooring and new Andersen windows. There is a second entrance of French doors into the sunroom from the porte-cochere on the side of the home. Moving forward from the front door through the sunroom you will see two sets of French doors. One set opens to the living room to the left with high ceilings, crown molding, and a gas fireplace. The second set opens to the dining room. A doorway leads from the dining room to the breakfast room and kitchen. The kitchen features white cabinetry, solid surface counter tops, and a gas stove. A counter separates the breakfast room from the kitchen and features matching built-in cabinets for display and a buffet for serving. Beyond the kitchen is a large laundry room. Natural gas is available for the stove, water heater, and dryer. From the living room, a doorway opens to the hall. Off the hall are several rooms, a den/bonus room, updated hall bathroom with a jetted spa tub, a large bedroom, and a family room. This family room is a flexible space as it was originally a bedroom and playroom and can easily be converted back to a bedroom or continue to use as a family room. French doors open from this area to a large screen porch overlooking the lake. The screened porch extends across the back of the home and is L-shaped with a bar area and entrance to the kitchen. Downstairs, hardwood flooring is in the hallway, bedroom, kitchen, and breakfast. New carpet has been installed in the living room and dining room. A staircase from the hallway leads upstairs to the dedicated private master suite and bathroom. The bathroom has been updated. There is a dressing room with lots of storage. Upstairs is freshly painted and has new carpet. A small balcony faces the lake from the master bedroom. The home features 2,600 square feet of living space and 3,800 total square feet. The property has a detached two-car garage with a cottage. The 600 square foot cottage has a living room overlooking the lake, kitchen, bedroom and full bathroom. Lakeside is a screened activity room for enjoying lake fun. There is a dock with private boat lift. The grounds have many varieties of antique camellia bushes. You will enjoy stunning sunsets in the evenings as the back of the home faces west. This special home has been in the same family for the past 40 years and is ready for new owners!